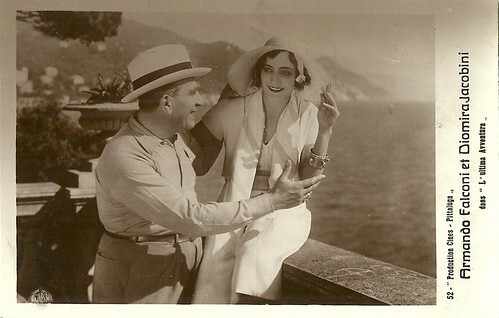 Diomira Jacobini and Armando Falconi were the stars in the Cines-Pittaluga production of L'ultima avventura/The Last Adventure (Mario Camerini, 1932). The postcards for this early Italian sound film have French-written captions at the backside, but are Italian. Italian postcard, no. 26. Photo: Prod. Cines-Pittaluga. Diomira Jacobini and Armando Falconi in L'ultima avventura (Mario Camerini, 1932). Italian postcard, no. 52. Photo: Prod. Cines-Pittaluga. Diomira Jacobini and Armando Falconi in L'ultima avventura (Mario Camerini, 1932). When for once in his lifetime Armando is too timid to confess his love, the young woman is courted by a second man of her own age (Carlo Fontana). When the young man declares his love to Lilly, the young woman leaves the old nobleman, who hesitated too long. The old Don Juan thus lets escape his 'last adventure'. Jacobini and Falconi had both been stars of the Italian silent cinema. And although Falconi was much older than his female colleague in real life too, he had a longer career in the sound cinema and starred in films till the late 1940s. L'ultima avventura/The Last Adventure's sets were designed by the art director Gastone Medin and the photography was done by Ubaldo Arata. 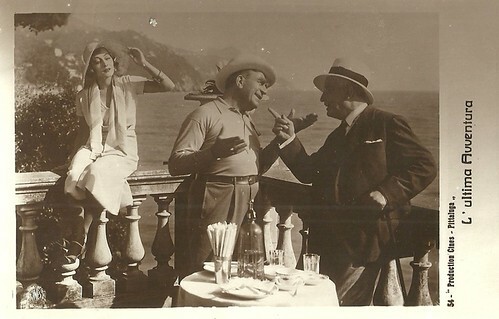 Italian postcard, no. 54. Photo: Prod. Cines-Pittaluga. Diomira Jacobini and Armando Falconi in L'ultima avventura (Mario Camerini, 1932). Italian postcard, no. 64. Photo: Prod. Cines-Pittaluga. Diomira Jacobini and Carlo Fontana in L'ultima avventura (Mario Camerini, 1932). Sources: Wikipedia (Italian and English) and IMDb.